Top Floor: The top level showcases a spacious comfortable kitchen/dining/great room with fireplace, TV, and deck/stair access to the front. The gourmet kitchen with granite counters and maple cabinets, hardwood and stone flooring is stocked with cooking utensils, dishes, wine glasses, silverware... Master bedroom has a walk in closet, large private bathroom and Hot Tub outside on the back deck. A separate 1/2 bath for guests is located on this level as well. We love mountain bike riding and walks in the woods or just around the neighborhood. In the summer, eating or just relaxing on the back porches overlooking the tree covered valley below is very peaceful. In summer or winter(snow shoeing) we love walking into downtown Truckee for lunch or shopping around or having a drink. Our vacation home is towards the lower part of Tahoe Donner so it's easy to get to all the amenities and into town for shopping and restaurants. Its also down a private drive with just a few homes, so its safe, quiet and secluded in a lovely forested setting. The cabin is warm, stylish and spacious and the owner, who is an interior designer, has put a lot of effort into the design of the space. We think you'll be impressed!! You and your guests can use all the amenities at Tahoe Donner, including tennis, gold, pools, recreations center, private beach at Donner Lake, downhill and cross country skiing!! This house was very spacious and nicely decorated in that mountain vibe. There was plenty of room for our party of 8. It is close to old Truckee and we enjoyed guest discounted skiing, snow shoeing and snow play at Tahoe Donner. Excellent home in the mountains for multiple family vacations. My family stayed in the "Classy Cabin" for the week of Christmas and thoroughly enjoyed our time there. Our family consists of individuals from 72 years to 8 months and came to the area from California, Colorado and Virginia. We were very happy with all aspects of the home which is nestled in a forest of tall pines in the Tahoe Donner area, just outside of Truckee. The layout and size of the home were perfect for us and the kids room, as advertised, was truly outstanding for our grandchildren...they loved it. Tahoe Donner itself offers many amenities such as snow play areas and a recreation center which we considered a huge plus. I would highly recommend this home to anyone, especially families.. The location even gave us a White Christmas. We are satisfied customers. 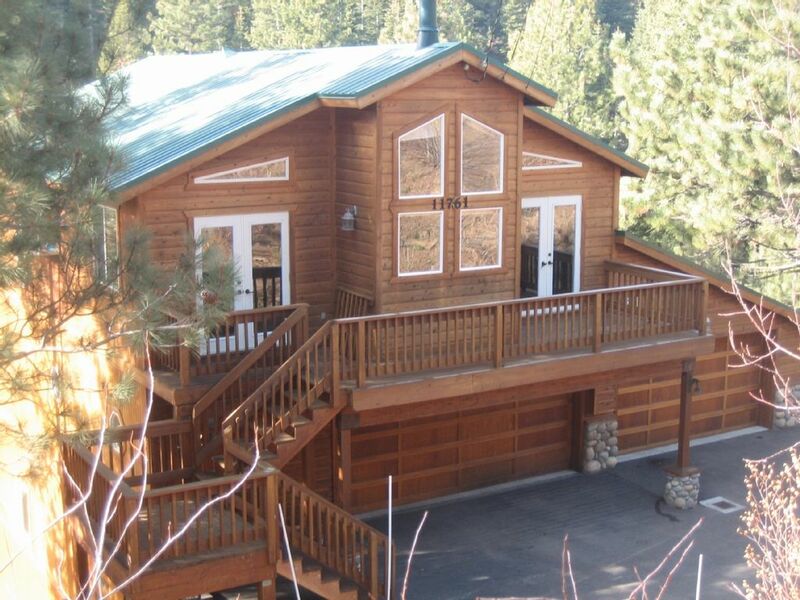 I rented this cabin for the Thanksgiving holiday. The cabin is roomy yet cozy and accommodated 6 adults and 3 kids perfectly, the teenagers loved the bottom floor. The kitchen worked great for cooking a holiday feast. The backyard was perfect for some snow play and snowy walks. The neighbourhood is very nice and close to all amenities.. Thanks so much Amy! It’s always a pleasure hosting you and your family. So glad you all had a good time!! Nice layout and excellent location. Property owners were easy to work with and very attentive . House has a nice layout, with 3 separate floors. Upstairs has ample space around the kitchen to gather, along with 2 decks. Middle floor has 2 guest rooms with adjoining deck. Downstairs was a great area for the kids. There is a “secret” room for the kids to sleep, along with a pool table and tv area. The owners were quick to respond when we thought there was an issue. Would definitely recommend this place! Our two family escape was perfect. We had 4 adults and 3 kids and plenty of space for all of us to spread out and hang out together. I highly recommend this cabin if available! The cabin is really big, with a lot of space. We went with kids and they enjoyed the kids room downstairs. We used Jacuzzi. The kitchen is huge.